Carmel Drago, RN, co-founded St. Joseph Hospice in 2002, bringing the clinical component required for a successful patient-care oriented hospice organization. Carmel began her hospice career following the death of her mother, when the need to help others facing loss became her primary focus. 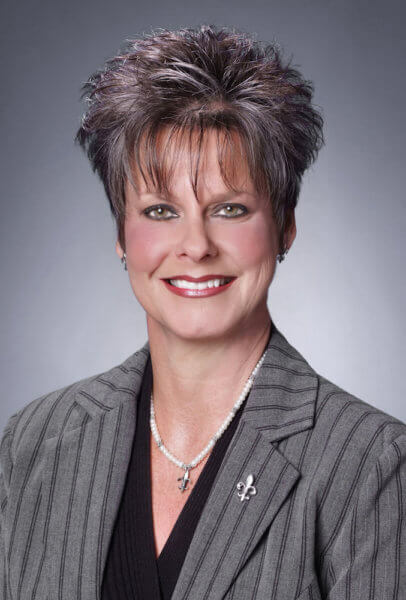 She currently serves as Administrator and Director of Nursing of the St. Joseph Hospice Baton Rouge location, as well as Chief Clinical Officer of The Carpenter Health Network. Prior to turning her career towards hospice care, she worked on hospital medical-surgical floors, in the Burn Unit of the Baton Rouge General Medical Center, as a surgical scrub and office nurse in a private physician practice, in general outpatient surgery and briefly in home health. She was instrumental in the opening of four hospice agencies in her career and also helped to facilitate the building and opening of The Carpenter House of St. Joseph Hospice, the first freestanding inpatient hospice facility in the Baton Rouge area. Under her guidance, St. Joseph Hospice’s Baton Rouge operation has achieved the gold standard of hospice accreditation through the Joint Commission since 2002. Serving in several positions within The Carpenter Health Network, Carmel was instrumental in opening and staffing AIM Palliative Home Health, a palliative care program provided through STAT Home Health for patients pursuing curative treatments or those not yet ready for the comfort care focus hospice provides. She helped facilitate the opening of Homedica, offering nurse practitioners and medical doctors who provide home visits to patients unable to travel to their physicians’ offices who require care in the home. A graduate in nursing from Nicholls State University, Carmel has worked in the Baton Rouge community for most of her life. She has formed many close relationships within the medical community and enjoys the rewards of working to provide quality end-of-life care.